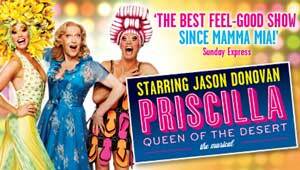 As already mentioned, Jason Donovan will be reprising the role of Tick/Mitzi (which he played in the West End) in the tour of Priscilla Queen of the Desert. More casting news is that Richard Grieve (best known as gay farrier Jonny Foster in Emmerdale) will play Bernadette. (He has also appeared in the show in the West End playing Tick/Mitzi) . Graham Weaver is Felicia (he originally understudied the role in the London production).